K'JIPUKTUK (HALIFAX) - Residents near Purcell’s Cove and Williams Lake backlands can finally breathe a sigh of relief — but just barely. 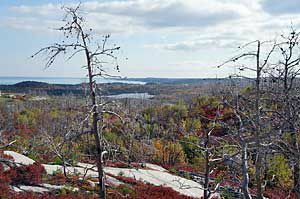 The motion to open the near 1,300 hectares of protected wilderness to development was defeated in an 8-8 tie vote by Halifax Regional Municipality council during Tuesday’s Committee of the Whole meeting. Under city rules, a tie means a motion at hand is dismissed. Lands around Purcell’s Cove Road, including Williams Lake and the community of Herring Cove, are a wellspring of cultural and ecological value, says Catherine McKinnon, a spokesperson for the Backlands Coalition, a group opposed to the proposed development. The coalition - made up of ten organizations committed to preserving the backlands - collected more than 1,000 signatures in a petition against developers’ request to rezone the area. The question to re-designate the backlands from urban reserve to urban settlement was one of many issues debated at Tuesday’s meeting. Councillors passed the final draft of the HRM’s regional plan five-year review process — including a number of recommendations made by a recent staff report in regards to proposed amendments that were raised in February. Councillor Stephen Adams motioned to amend the designation of the backlands on behalf of several developers who own parts of the lands, including Clayton Developments who have approximately 360 hectares of property. As an urban reserve, the backlands are protected from development until 2031, at which time a new regional plan will be set in place, said city planner Austin French. He cited the report’s recommendation to maintain the backland’s urban reserve status due to a lack of information on the area’s capacity for service expansion. Re-designation would result in “premature infrastructure expenditures”, according to the report. As it stands the area’s wastewater management cannot support new developments, French said. He told council that should they decide to revisit the issue in the future, that they do so as a larger infrastructure project of Halifax Water. McKinnon echoed the staff report, saying there are ample amounts of fully serviceable land available in the western region and that no needs exists to build on undeveloped land. “Once we pave over a forest, that’s it. It’s not going to come back,” she warns. For McKinnon and the coalition, to open the backlands to developers would lead to its destruction. She says the backlands are home to a variety of hiking trails, lakes and wetlands that are not only appreciated by the area’s residents, but by people throughout the province. After his first amendment was defeated, Councillor Adams tabled a second, more surprising motion to enter a public engagement process on the possibility of purchasing the backlands. One option would be for the city to purchase the land and turn it into public property, Adams explained. He also said the province may be an interested buyer, given how the area’s MLA, Brendan Maguire has had an outspoken interested in persevering the backland’s wilderness. Apart from Clayton Developments, the coalition says land would have to be bought from Battery Hill Developments, Bess Developments as well as two private landowners. Adams said the backlands are only one of the the city’s seven parcels of urban reserve that will be put forward to public discussion.